This PDF 1.5 document has been generated by Microsoft® Office Word 2007 / 䵩捲潳潦璮⁏晦楣攠坯牤′〰㜻⁭潤楦楥搠畳楮朠楔數琠㈮ㄮ㜠批‱吳塔, and has been sent on pdf-archive.com on 30/07/2012 at 20:28, from IP address 24.253.x.x. The current document download page has been viewed 574 times. 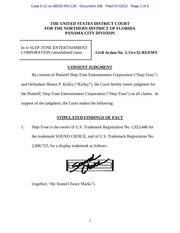 the trademark SOUND CHOICE, and of U.S. Trademark Registration No. (together, “the Sound Choice Marks”). entertainment services to patrons at various times and places. registered as described above and are identical to the marks placed by SlepTone on its own goods. having been acknowledged under 15 U.S.C. § 1065 as incontestable. marked with the Sound Choice Marks. Slep-Tone has suffered significant damage to its property. 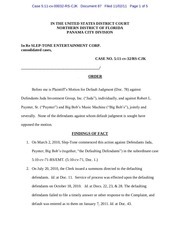 Slep-Tone has elected to receive an award of statutory damages. 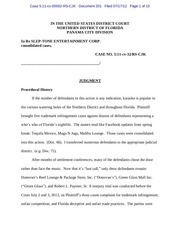 The parties have consented to the entry of this judgment. U.S.C. § 1331 because the action is founded upon an act of Congress. 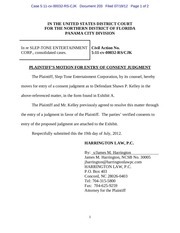 Kelley’s actions constitute trademark infringement involving counterfeiting. much as $2,000,000 per registered mark infringed. deterrent effect to Kelley and others who would act similarly. unauthorized use of the Sound Choice Marks by Kelley. ($25,000.00), together with interest thereon at the legal rate until paid. SOUND CHOICE®, or the mark in U.S. Trademark Registration No. No costs to either party. ORDERED on July 23, 2012. This file has been shared by a user of PDF Archive. Document ID: 00042438.